According to Wikipedia, in complex analysis an essential singularity of a function is a “severe” singularity near which the function exhibits extreme behavior. The category essential singularity is a “left-over” or default group of singularities that are especially unmanageable: by definition they fit into neither of the other two categories of singularity that may be dealt with in some manner – removable singularities and poles. No need to panic, a lot of analysts tell us, since far from being on the verge of some earth shattering event Japan has invented the economic equivalent of a mechanical perpetual motion machine. Or as Nobel economist Paul Krugman put it recently, “while there is much shaking of heads about Japanese debt, the ill-effects if any of that debt are by no means obvious”. Maybe there is just one word missing here – yet. This, however, will not be the viewpoint taken here. The rise and rise of Japanese debt is far from benign, and the dynamic, we are convinced, will at some point become unsustainable. Unfortunately by the time we reach that point it will be too late. Indeed, given that we agree with Krugman that the underlying cause of Japan’s malaise is demographic, after several decades of ultra-low fertility in all probability it already is too late. The root of the problem is, as he says – wait for it – that there is “a shortage of Japanese”. 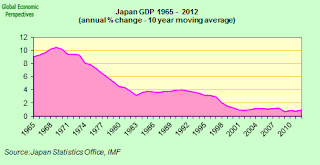 Japan’s problem is benign, so the argument goes, since the country has an external surplus, and can print its own money. As a result there is a savings surplus, and no problem selling government debt, even at ridiculously low interest rates. And since the interest paid remains ridiculously low, then there is no problem servicing the debt, and if there ever was, why then the Bank of Japan could just buy even more of its own government bonds, effectively driving the interest rate even lower. In theory there is no good reason why it couldn’t even follow the lead being currently set in Germany, and push the rate into negative territory. Heck, the government would then be even earning income on its debt. It would be a good investment. But somehow or other this view fails to convince. In particular it fails to get to grips with why Japan has gotten into this situation. It also doesn’t offer any kind of road-map for how the country could ever get back to the sort of monetary regime that was once widely considered to be “normal”. Or perhaps, in the world we now live in, as the US novelist Thomas Wolf once put it “you can look homeward angel” but in fact “you can never go home again”. Which is just a very poetic way of saying that time has an arrow, and that some processes are irrevocable and irreversible. So, if this is what you were hoping for, then bad luck, since there is simply going to be no such thing as a return to normality for Japan. That being said, what we have to avoid at all costs is Japan becoming the “new normal”, the text book case of a society where the fundamental mismatch between declining demography and appeasing an ever older electorate with populist politics leads to complete dysfuncionality, a dysfunctionality which is then reiterated in one country after another. From this point of view it is fascinating to note just how fast Japan is getting towards “the end of the road”. Some investors have even been getting ahead of themselves and frantically shorting Japanese debt in the anticipation of future and continuing credit downgrades, without asking themselves the really awkward question – what happens to the country if it is eventually forced to default on its debt. It’s equally fascinating that so few people are really talking about this development at the moment. The assumption that things can more or less go on and on is widespread both in and outside Japan. Despite the frequent references to “Japan’s lost decade”, the country has now lost not one, but two – what was it Oscar Wilde said, losing one child could be an accident, but losing two surely has to constitute negligence – and as things are shaping up we seem to be all set to have a third one in front of us, markets and weather permitting, always assuming the Japanese government remains able to finance its debt. But let’s keep the debt issue for later and start with the demography – here Japan is certainly a real global leader, in this case for its advanced population ageing. Japan is not only an ageing society: It’s THE ageing society. Following decades of an ultra low birth rate and negligible immigration, it faces a steady decline in its working-age population and a rising dependency ratio for decades to come. There is no changing this now. Even some “miracle” reversal of the fertility problem would take decades to work through, so whatever happens next, things will get worse before they get better. Japan’s population – in median age terms – is the oldest on the planet. Median age is around 45, and it will continue to rise. There is no real prospect of it coming back down again, since the process it is experiencing appears to be totally irreversible. Forecasts see the median age in Japan rising to more than 50 within the next two decades, and really here we are breaking totally unknown territory – no society in the whole of human history has ever been this old. Given this prospect, it is natural to expect that the country should save heavily to make provision for the future–and it does. But a country with an ageing and declining workforce gets an additional problem, one of structural demand deficiency due to the changing balance between saving and borrowing. Investment opportunities in Japan are limited, so that businesses will not invest all those savings inside the country itself. The only surprising thing is that people are still surprised by this. The conclusion we draw from the above is a simple one – if Japan is going to see a decline in working population over the next several decades (and possibly much longer, since so long as fertility remains below replacement rate each generation will be smaller than the previous one) and if this lies at the heart of the deficient domestic demand deflation problem, then it means the issue is a deep structural one which won’t be resolved by any kind of “kick start”, however large. The only consequence of having permanent fiscal injections will be not to give stimulus, but rather an accumulation of debt that will be increasingly harder for those smaller and poorer workforces to pay down in the future – especially if the process is associated with ongoing deflation. To use an analogy – it isn’t simply a question of a planet which has slipped off or strayed from its orbit (or “good equilibrium”), and just needs a nudge to get it back on, what we have is a planet which has veered off onto a whole new trajectory, one which leads to who knows where. This situation was never contemplated by the founders of neoclassical theory, and yet, having started in Japan, the phenomenon is now extending itself steadily across all developed economies in one measure or another. As long as Japan is the only guy in town facing this kind of problem, there is a simple solution – invest national savings abroad, in countries where populations are younger and still growing, and returns on capital are surely higher. These other nations should be able to pay back loans when they are richer and older, supplying some of the funds needed to meet Japan’s pension promises and other obligations. Up to the arrival of the global financial crisis Japan played this game well because it was the only one playing it. The problem is that now every single OECD economy, one after another, will steadily be looking to do the same. So in similar fashion, those who urge a solution to Europe’s imbalances via an increase in German fiscal deficits to stimulate consumption miss the point: arguably what people in these societies need to do is save more, not less, and certainly when it comes to the public sector. 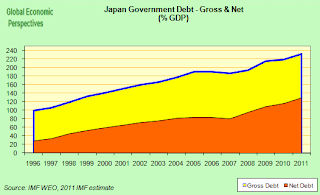 Amazingly, Japan is the only developed economy still expanding its annual budget deficit even though the economy is saddled with, by far, the biggest debt burden – gross government debt is now around 235% of GDP. Now many make light of Japan’s economic growth problem since with the 15 to 65 population falling, output per worker is not performing badly. As Paul Krugman so cogently puts it, “you can argue that demographically adjusted, the whole tale of Japanese stagnation is a myth.” You could, that is, if it weren’t for the growing debt. Simply thinking about GDP per member of the active population is very misleading, since what you need to thing about is the elderly dependency ratio, how many people, that is, each member of that steadily shrinking workforce has to support. This is where the real action is. And the IMF draws a scenario, in which a wrong combination of circumstances at an inopportune moment in time could easily send Japan spiralling to where Italy and Portugal are now: “Market concerns about fiscal sustainability could result in a sudden spike in the risk premium on JGBs, without a contemporaneous increase in private demand. Once confidence in sustainability erodes, authorities could face an adverse feedback loop between rising yields, falling market confidence, a more vulnerable financial system, diminishing fiscal policy space and a contracting real economy”. We’re just now seeing the beginning of this scenario. The average rate of maturity on JGBs is being pushed down due to investors buying the short end in combination with the purchasing program from the BOJ. Where have we seen this before … oh yes, the eurozone periphery. You try to see what yield Japan would need to pay for for a MARKET based 10y or 30y issuance of a decent size. Our best guess is way, way above its nominal growth and herein of course lies the problem. Japan ran a 10% deficit last year and there are no signs of consolidation in 2013. Meanwhile the current account surplus is starting to play the vanishing man act. Japan will run out of sufficient savings to buy the whole issue of JGBs by 2016, but the possibilities are the market will respond sooner. If the Japanese government continues to issue debt, the Japanese economy is going to run out of savings to buy the new debt. The share of government debt to total currency and deposits will soon reach close to 100%. At this point of the endgame, there is no way out for Japan: either the central bank or foreigners must take up the bid, or Japan must begin to sell off foreign assets. Markets will price in the endgame before it happens…. then it will be game over! Yawwwwwwn. Please retire these old tropes. Japan is just going to be one of the 1st advanced societies which will achieve Zero Population Growth, and reach a equilibrium. Japan does not have the energy production to support the hundreds of Millions of people on its island. It needs to reduce, slowly to get to a more sustainable place. Otherwise the “tiger” of imperial Japan will look to further shores again to keep the perma-growth machine continuing. If Japan can do this reduction in a soft way, even with a soft-crash, this is by far the best of all outcomes. No crisis here, move along. Next! If by “zero” you mean “negative”, yes. That would be an eccentric definition of the number. How is the decline in fertility distributed? Or more specifically, does the Tokyo Area have a higher birth rate than the rest of the nation? 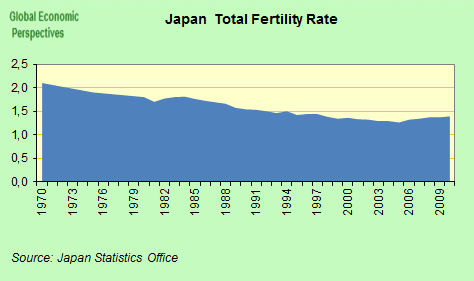 I suspect that the overall birth rate is being averaged down lower because of absolutely collapsing birth rates in Japan outside of Tokyo, but I don’t have definitive proof. If it’s true, then it would be more that Japan is contracting into a city-state around Tokyo than just contracting overall. There is no doubt that at the heart of Japan’s decline is the frightening pace of people leaving the workforce, rising dependency ratio, falling fertility rate, refusal to make immigration easier, and deaths outpacing births (since 2006). ‘Japan is running out of Japanese’ and its only near term salvation is that it got rich before it got old, now will become poorer as its population declines. Tokyo seems to have a lower fertility rate than the rest of Japan, but it continues to attract migrants from the rest of the country. The Tokyo-Yokohama metropolitan area’s share of the overall population of Japan thus continues to ascend. I guess I don’t have a dire a view as you on all of this. If BOJ created 4% inflation, the government went big on green (which would larely wipe-out the imports it needs in energy), along with reduce the cost of food and housing (resulting in probably improved demography), I think this situation would clear itself up. 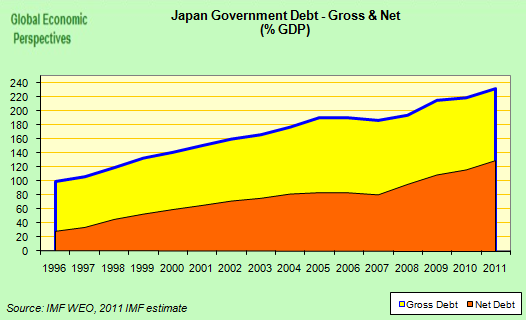 If France and Britain after the Napoleonic wars could clean up bond debt at 200%+ GDP, surely Japan can. Frank, low fertility rates in Japan have relatively little to do with the cost of living and much more to do with the constricted roles in Japanese society available for women. Force women who have the capability to become educated and economically productive to choose between that and being traditional mothers, and enough women will opt for the former option to knock fertility down substantially. “Japan is just going to be one of the 1st advanced societies which will achieve Zero Population Growth, and reach a equilibrium”. As Randy points out, we aren’t talking about zero population growth, we are talking about slow but steady melt down, with each generation being about two thirds of the size of the one before. There is no equilibrium here, that is the whole point. Steadily shrinking economies wouldn’t be such a huge deal if it weren’t for the big shift in the age structure, with so many old people being supported by so few young ones. So Japan cancels some of its domestic debt, who gets hit? Those expecting pensions, or systematic health care. Does this matter? As I say, the balance of opinion appears to be that it doesn’t. On creating inflation, this is just the point, Japan is stuck in inflation. I don’t believe they can create permanent inflation at 2%, let alone 4%. They can get a “one off”, by significantly weakening the currency, but then the problem would come back again, since there is structurally deficient domestic demand, and no equilibrium point in sight. “The crisis takes a much longer time coming than you think, and then it happens much faster than you would have thought”.